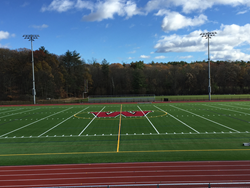 Weston High School in Weston, MA is intalling two new Shaw Sports Turf synthetic turf fields as part of an upgraded athletic complex. The community of Weston High School, located in a residential suburb just west of Boston, showed up big when it came to the decision to improve some of the school’s athletic facilities. As part of the Weston High School Athletic Complex project, the school installed 91,583 square feet of Shaw Sport Turf’s Legion HP 2.0 synthetic turf. Legion is a combination of high-performance monofilament fibers and durable slit film fibers. The slit film fiber is a workhorse which provides durability and decreased infill flyout, while the monofilament provides a more resilient surface that enhances performance and aesthetic characteristics. The formerly natural grass playing surface at Proctor Field as well as the school’s only existing synthetic turf field now feature Shaw Sports Turf. The new synthetic turf fields will be used for football, boys and girls lacrosse, boys and girls soccer, and field hockey. A wholly-owned subsidiary of Berkshire Hathaway Inc., Shaw Industries is a full flooring provider to the residential and commercial markets. Shaw supplies carpet, hardwood, laminate, resilient, and tile/ stone flooring products, as well as synthetic turf. Shaw Sports Turf is one of the leading synthetic turf companies in North America and has represented quality and innovation for more than two decades with over 3,000 successful installations, including an impressive list of high-profile field installations. For more information please visit http://www.shawsportsturf.com, call 866-703-4004 or find us on Facebook and Twitter.